much better now. peppermint tea and lemon ginger cookies in the afternoon. it’s the first moment of respite in a hectic week filled with deadlines, house renovation, taxes, and company. but i feel strangely rested and purged. i think mainly due to the fact spring has arrived and I can finally let a fresh breeze into the house. is it the spring that begs us to stop for a moment and see that everything is as it should be? at the root of my being i want to clean the winter dust off of everything, and purge my house of anything unnecesary. how wonderful that our biological urges are still intact in this period of staring at screens all day. somewhere in the depths of our bodies the animal nature breathes and makes us want to go walk on the earth again after the thaw. how is it that the smell of the earth is like a tonic that calms us into a calm state, even when we are surrounded by concrete and cars? the body knows more about what it needs than we do. it craves flowers and green and air that moves through the trees. it speaks to the trees and the trees speak back, but somewhere along the way we lost the ability to hear the language. but it’s there. i know it. the average child is able to identify hundreds of corporate logos, yet incapable of naming the species of tree in their own backyard. Yet they still communicate with the tree even if they don’t know it. it must have something to do with the urge to build a house up in the branches, or build a fort in the roots. just thinking about forts made me want to build one for myself. out of chairs and blankets. i want to hide a pile of books in there and sitting reading for the rest of the afternoon. and listen to what the trees have to say. time to put some thoughts down here. no, wait. first make tea and then take the laptop outside and write in the sun. yes. back in a minute. 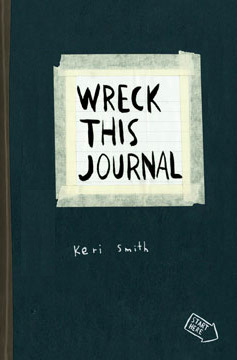 the wreck this journal site is going crazy! thank you so much for all your participation. i know you have probably already heard about this through other sources (the site was leaked by a few readers earlier than was planned), but I am officially launching the site for wreck this journal (the book will be out in june). and I need to recruit your participation. so go read about it and comment away! p.s. i’m very excited about this. doing an interview this week has helped me to solidify some of my thinking on what i am attempting to do in this world. i don’t think one should ever be too solid in their thinking, as it puts one at risk for dogmatic thinking, and halts the investigative process. but it is helpful to step back from your own process from time to time and notice the connections between lines of thinking, concepts, and methods. i think i am noticing that my current methods involve being part scientific investigator, part philosopher, part ecopsychologist, and part artist. the senses are what keep me connected to the natural world. i do not forget that at the root of my existence i am an animal. sitting in front of screens for too long dulls the senses and turns us into passive creatures disconnected from the earth. when was the last time we spoke to the animals outside our windows? i have started to document the different bird calls in my neighborhood and notice the birds that make these sounds. yesterday we heard a new one, and looked up to see what appeared to be a baby hawk. it’s call was so strange and foreign to me. I wondered if native peoples of the area would have heard a message in it and have been able to speak to it in return. as the snow continues to melt i am aware of the earth beneath my feet exhaling and throwing up that wonderful wet smell that tells you spring is coming. I notice more joggers now (needing to move their muscles after the winter), a few car windows cracked to let in the smell, and the tiny rivers of water running alongside the roads, (snow escaping the warm air). early this morning the trickster ice threw me to the ground in a failed attempt at keeping spring at bay. but i got the last word as i looked at the ground an hour later to see him transformed into a pool beneath my feet. i showed him the bandaids on my right hand as a message. your time has come. i am going out today wearing shoes instead of boots, to count the smells and feel the earth breathing again after a long sleep. piece of paper found on the street, troy, ny. feb. 2007. the other side has cursive writing lessons done by a young child. i was in a restaurant last week and saw the sign above. the “room” had worn away, it looked almost as if someone had peeled it. and i thought ‘how wonderful’, a sign telling me to rest. i instantly thought of creating a bunch a stickers to that affect and posting them all over town. just a small reminder to take a breather. i suppose that is what i am doing right now, though my life is full of too many practical things that needed doing, (which include fixing plumbing. i do not shy away from doing these things myself.) my hands currently smell unpleasantly of metal, and my hair damp from a dripping tap. you may have noticed that i am always in tune with the smells of a place. now i can add sounds to that, after my class with Pauline last season. two days ago i stopped over a sewer grate and listened to the dripping sounds for quite some time. i notice that i am much more able to hear changes in a sound, and connections to other sounds in the environment. last week i saw a fascinating lecture by Bob Stein, director of the institute for the future of the book. while at first i found myself feeling protective and upset about this medium (book) that i love so much evolving (into a more interactive/all encompassing format, incorporating all mediums, but more specifically moving towards something more wiki based, where the readers have some interaction/influence with the piece), over the course of the evening I realized that this intense emotion is exactly the thing that gets my creative juices spewing in new directions. sometime during the night my fearful thoughts changed to excitement. excitement at the possibilities of experimenting with a new medium, not necessarily as a replacement but instead as a completely new medium altogether. as an artist i have a chance to ‘shape’ it in some way if i choose. i did not sleep much that night and spent some of the next day reading and taking notes, and feeling new ideas flow in. after reading the interview with Alan Kay who mentioned taking a historical look at technology, i was reminded of Jane Jacobs, who suggests in “the life and death of great american cities” that if you want to create a city that works, you must first take a long detailed look at how and what people do in/with a space. she recommends sitting at a busy street corner for hours at all times of the day and just observe. to quote marti guixe, a designer that I am fond of, “I’m interested in our habits, in the relationship between the body and our actual environment.” somewhere in here lies the solutions to what form the future books will take. all of these things are roaming about my head these days.